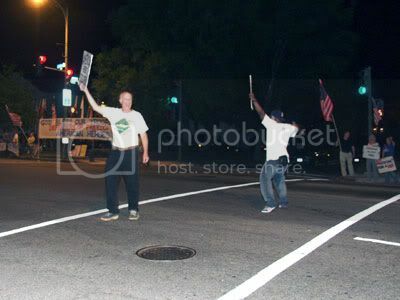 For several years the intersection of Georgia Ave and Elder St in D.C. was occupied every Friday evening by a Codepoink/SEIU coalition. 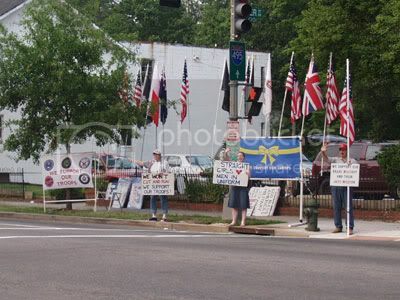 They used this intersection at the gates of Walter Reed Hospital to stage their anti-war, anti-America, anti-military, Bush-Bashing demonstrations. And they called it supporting the troops. In their arrogance and complacency they let their permits expire. A organization of patriots, known as the Free Republic, were standing by and immediately seized the opportunity to secure those permits. 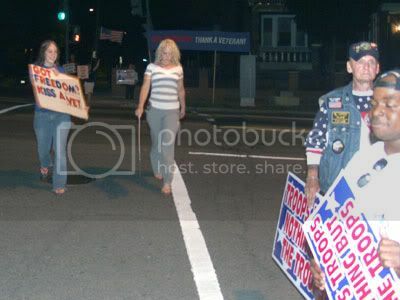 Now, every Friday night that intersection is populated by American patriots. Finally, American flags are displayed and flown with pride and honor on all four corners. The signs being held express love, respect and admiration for our wounded soldiers. 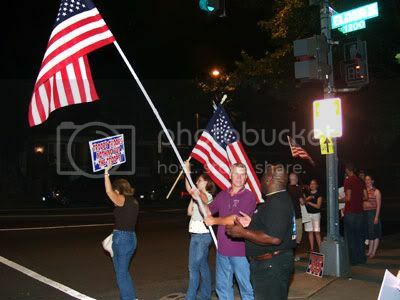 The voices being raised shout praise and allegiance to America. 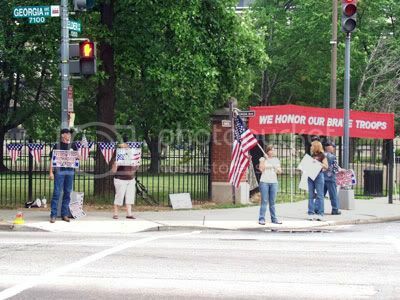 Freepers know how to do Troop Support. And the Codepoink/SEIU moonbats have been relegated a block down to the bus stop. On June 29, 2007 a group of Eagles gathered at the I-95 Welcome Center on the North Carolina – Virginia border. 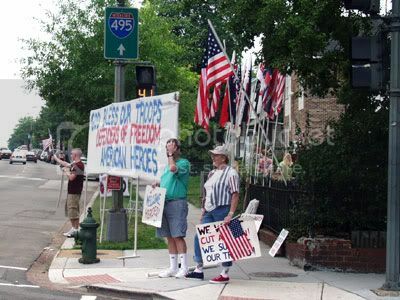 A caravan of vehicles, all brandishing American flags, left from there and headed to D.C. to take a stand with the Freepers. On the way we were joined by two Virginia Eagles. 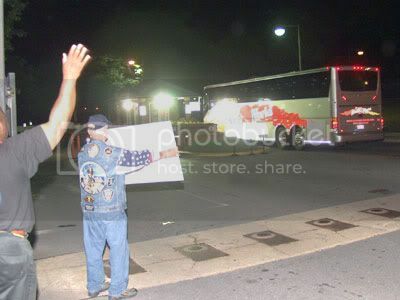 Mike Blankenship and wife – Suffolk, VA.
1 – The moonbats leave. 2 – The bus arrives. Before I explain the bus, I want to tell you about the traffic. – The volume of traffic on Georgia Avenue was unbelievable. Not volume as in quantity, volume as in sound levels. Almost all vehicles passing through were blowing their horns – waving, and some cheered. A taxi van stopped in the center of the intersection, the driver locked the horn while waving his own American flag and yelling. I was truly taken by surprise by the amount of support shown by the people driving that avenue. Cause, ya know, according to the media and the liberal left (redundant, I know), this kind of patriotic attitude is obsolete and no longer exists. – Every Friday evening, a large bus takes wounded soldiers from Walter Reed, along with their families, to dine at a restaurant. The return trip brings them back to Reed through the gates at the intersection of Georgia and Elder. 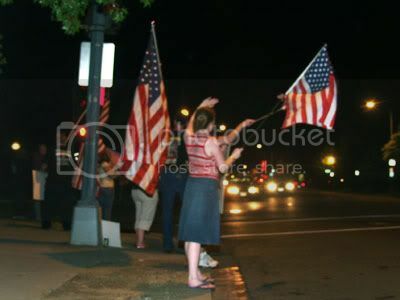 When the bus stops at the check-point, the Freepers (and on this night, the Eagles) surround it waving flags and shouting support and love for the men and women inside who sacrificed so much for their country. That’ll give you chicken skin. After the bus went on inside and we all said our goodbyes to our new Freeper brethren, we packed it in and headed back to our motel. We needed a good night’s sleep, because we were leaving at 6:00 the next morning to go to Ft. Monmouth, New Jersey. Jersey has moonbats too. When we got to our motel, there was a man sitting outside. 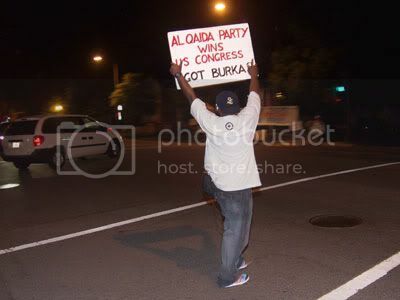 As we approached, he stood and demanded to know where we had spent our evening. We told him. Tears welled in his eyes and he thanked us. He and his son, a wounded Marine, were on that bus. There’s the chicken skin again. June 29th, 2007 under Uncategorized.